فرهنگی, محمد, حسینی, سیدعباس, جعفریان, حجت الله, قربانی, رسول, هرسیج, محمد, سوداگر, محمد, میرا, سیدسحاب, بلاش, عبدالحلیم. (1397). اثرات پرورش ماهیان خاویاری در محیط محصور (پن) بر کیفیت آب در خلیج گرگان. فصلنامه محیط زیست جانوری, 10(2), 217-230. محمد فرهنگی; سیدعباس حسینی; حجت الله جعفریان; رسول قربانی; محمد هرسیج; محمد سوداگر; سیدسحاب میرا; عبدالحلیم بلاش. "اثرات پرورش ماهیان خاویاری در محیط محصور (پن) بر کیفیت آب در خلیج گرگان". 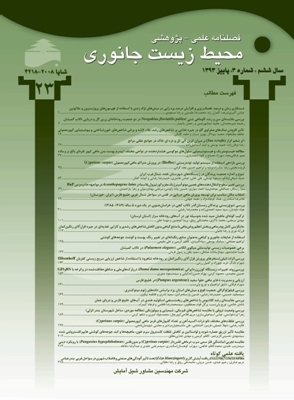 فصلنامه محیط زیست جانوری, 10, 2, 1397, 217-230. فرهنگی, محمد, حسینی, سیدعباس, جعفریان, حجت الله, قربانی, رسول, هرسیج, محمد, سوداگر, محمد, میرا, سیدسحاب, بلاش, عبدالحلیم. (1397). 'اثرات پرورش ماهیان خاویاری در محیط محصور (پن) بر کیفیت آب در خلیج گرگان', فصلنامه محیط زیست جانوری, 10(2), pp. 217-230. فرهنگی, محمد, حسینی, سیدعباس, جعفریان, حجت الله, قربانی, رسول, هرسیج, محمد, سوداگر, محمد, میرا, سیدسحاب, بلاش, عبدالحلیم. اثرات پرورش ماهیان خاویاری در محیط محصور (پن) بر کیفیت آب در خلیج گرگان. فصلنامه محیط زیست جانوری, 1397; 10(2): 217-230. تحقیقات حاضر به ­منظور بررسی اثرات پرورش ماهیان خاویاری در محیط محصور (پن) خلیج گرگان برکیفیت آب در مدت یک­سال از مرداد 1394 تا تیر 1395صورت گرفت. 3 محیط محصور مستقر در جزیره آشوراده - بندر ترکمن به ­عنوان شاخص مورد ارزیابی قرار گرفت. ماهیان خاویاری صید شده از دریا به ­ترتیب با وزن متوسط و تراکم متوسط 12/28±21/00 کلیوگرم و 21/66±25/00 قطعه در هر حصار ذخیره­ سازی شدند. میزان کل غذای ورودی طی دوره آزمایشی ثبت گردید. 5 ایستگاه با 3 تکرار شامل مرکز حصار، شعاع 5، 25، 50 و 100 متری از حصار درنظر گرفته شد. تغییرات عوامل فیزیک و شیمیایی آب مورد ارزیابی قرار گرفت. نتایج حاصل از تغییرات فصلی عوامل فیزیک و شیمیایی آب نشان داد که فاکتورهای شفافیت، کدورت، میزان کلروفیل آلفا و سیانو باکتر، فسفر و فسفات اختلاف معنی ­دار را در بین فصول نشان ندادند (0/05<p). نتایج نشان داد که پرورش ماهی در حصار سبب تغییرات معنی­ داری در فاکتورهای مصرف اکسیژن شیمیایی، مصرف اکسیژن بیولوژِیک، میزان نیتریت، آمونیاک کل، کل مواد جامدمعلق داشت (0/05>p). هم ­چنین ثابت شد، با فاصله گرفتن از حصار میزان گل آلودگی و میزان کلروفیل آلفا کاهش و میزان کدورت افزایش می ­یابد. بیش ­ترین میزان کلروفیل آلفا، مصرف اکسیژن بیولوژیک، مصرف اکسیژن شیمیایی، نیتریت و آمونیاک در ایستگاه 25 متری بود که با سایر ایستگاه­ ها اختلاف معنی­ داری را نشان داد (0/05>p). مطالعه هم ­چنین ثابت کرد تغذیه می ­تواند باعث افزایش میزان فسفر در محدوده حصار شود گرچه معنی­ دار نبود (0/05<p). نتایج مطالعه نشان داد بیش ­ترین تاثیر پرورش ماهی بر کیفیت آب در شعاع 5 متری از حصار بود. ستاری، م.، 1382. ماهی شناسی. جلد 2. انتشارات حق شناس. 655 صفحه. محمدخانی، ح.؛ طاهری، ح.؛ امینی، ک. و منصوری، ب.، a 1393. ﻣﺪلﺳﺎزی ﺗﻮزﯾﻊ ﻣﮑﺎﻧﯽ آﻟﻮدﮔﯽ­ﻫﺎی ﻣﺨﺘﻠﻒ و ارزﯾﺎﺑﯽ ﻗﺎﺑﻠﯿﺖ آﺑﺰی­ﭘﺮوری درﺧﻠﯿﺞ ﮔﺮﮔﺎن. اولین همایش آبزی ­پروری نوین فرصت­ ها، چالش­ ها. دانشگاه علوم کشاورزی و منابع طبیعی گرگان، ایران، گرگان، 17 صفحه. محمدخانی، ح.؛ طاهری، ح.؛ یلقی، س. و حامی ­طبری، ا.، b1393. ﻣﺪل­ سازی ﮐﯿﻔﯽ دوﺑﻌﺪی و ﻣﮑﺎن­ﯾﺎﺑﯽ آﺑﺰی­ﭘﺮوری در ﺧﻠﯿﺞ ﮔﺮﮔﺎن ﺑﺮاﺳﺎس ﺗﻮان ﺧﻮدﭘﺎﻻﯾﯽ. اولین همایش آبزی ­پروری نوین فرصت ­ها، چالش ­ها. دانشگاه علوم کشاورزی و منابع طبیعی گرگان، ایران، گرگان، 33 صفحه. میردار، ج.؛ ارشدی، ع.؛ نکوهی، م.؛ شهریاری ­مقدم، م. و لطفی، م.، 1388. بررسی اثرات پرورش ماهی قزل­ آلای رنگین­ کمان در قفس­ های شناور بر کیفیت آب شرب مخزن چاه نیمه در منطقه سیستان. سومین همایش و نمایشاه تخصصی مهندسی محیط ­زیست، ایران، تهران. Alpaslan, A. and Pulatsü, S., 2008. The effect of Rainbow Trout (Oncorhynchus mykiss Walbaum, 1792) cage culture on sediment quality in Kesikköprü Reservoir, Turke. Turkish Journal of Fisheries and Aquatic Sciences. Vol. 8, pp: 65-70. APHA, 2003. Standard methods for examination of water and wastewater. American public health association, Washington DC. 154 p.
Apostolakia, E.A. ; Tsagarakia, T.; Tsapakisa, M. and Karakassis, I., 2007. Fish farming impact on sediments and macro fauna associated with sea grass meadows in the Mediterranean. Estuarine, Coastal and Shelf Science. Vol. 75, No. 3, pp: 408-416. Ballali, S.; Hosseini, S.A.; Ghorbani, R.; Kordi, H. and Amooei Khoseini, E., 2013. Relationships between nutrients and chlorophyll-a concentration in the international Alma Gol Wetland, Iran. International Journal of Aquatic Biology. Vol. 12, pp: 68-75. Belias, CH.V. ; Bikas, V.G. ; Dassenakis, M.J. and Scoullo, M.J., 2003. Environmental impacts of coastal aquaculture in eastern Mediterranean bays the case of astakos gulf, Greece. Environmental Science and Pollution Research. Vol. 10, No. 5, pp: 287-295. Chapman, D., 1996. Water Quality Assessment E and FN spon, an imprint of Chapman and Hall. 2nd Edition. Cornel, G.E. and Whoriskey, F.G., 1993. The effects of rainbow trout cage culture on the water quality, zooplankton, benthos and sediment of Lac du Passage, Quebec. Aquaculture. Vol. 109, pp: 101-117. Hallare, A.V. ; Factor, P.N. ; Santos, E.K. and Hollert, H., 2009. Assessing the Impact of Fish Cage Culture on Taal Lake (Philippines) Water and Sediment Quality Using the Zebrafish Embryo Assay. Philippine Journal of Science. Vol. 138, No. 1, pp: 91-104. Jahani, N.; Nabavi, S.N.B. ; Dehghan Madiseh, S.; Mortezaie, S.R.S. and Fazeli, N., 2012. The effect of marine fish cage culture on benthic communities using BOPA index in Ghazale Creek (Persian Gulf). Iranian Journal of Fisheries Sciences. Vol. 11, No. 1, pp: 78-88. Khodami, S.; Attaran Fariman, G.; Ghasemzadeh, J. and Mortazavi, M. S., 2012. Comparison of different nitrogen compounds in three different environments of the Gwatar shrimp farms complex in the Gwatar Gulf region (Baluchistan-Iran). Iranian Journal of Fisheries Sciences. Vol. 10, No. 4, pp: 663-677. Longgen, G. and Zhongjie, L., 2003. Effects of nitrogen and phosphorous from fish cage culture on the communities of a shallow lake in middle Yangtze River basin of Chain. Aquaculture. Vol. 226, pp: 201-212. Mente, E.; Pierce, G.S. ; Maria Begoña Santos, M. and Neofito, C., 2006. Effect of feed and feeding in the culture of salmonids on the marine aquatic environment: a synthesis for European aquaculture. Aquaculture International. Vol. 14, No. 5, pp: 499-522. Mrcelic, G.J. and Sliskovic, M., 2010. The impact of fish cages on water quality in one fish farm in Croatia. World Academy of Science, Engineering and Technology. Vol. 4, pp: 08-25. Mwachiro, E.C. ; Makilla, D.; Bett, D.K. and Ndeje, G.K., 2012. A Comparative study of cage and earthen pond culture of Oreochromis Jipe, in Lake Jipe, Taita/Taveta district, Kenya. Global Advanced Research Journal of Agricultural Science. Vol. 1, No. 7, pp: 163-181. Nyanti, L.; Hii, K.M; Sow, A.; Norhadi, I. and Ling, T.Y., 2012. Impacts of aquaculture at different depths and distances from cage culture sites in Batang Ai Hydroelectric Dam Reservoir, Sarawak, Malaysia. World Applied Sciences Journal. Vol. 19, No. 4, pp: 451-456. Phillips, M.J; Beveridge, M.C.M. and Ross, L.G., 1985. The environmental impact of salmonids Cage culture on Inland fisheries: present status and future trends. Journal Fish Biology. Vol. 27, pp: 123-137. Philipose, K.K. ; Krupessha, S.R. ; Jayasree, L.; Ayasree, L.; Damodaran, D.G. ; Syadarao, G.; Vaidya, N.G. ; Mhaddolkar, S.S; Sadhu, N. and Dub, P, 2012. Observations on variations in physic chemical water parameters of marine fish cage farm off Karwar. Indian Journal Fish. Vol. 59, No. 1, pp: 83-88. Rodríguez-Gallegoa, L.; Meerhoffa, E.; Poerschc, L.; Aubriota, L.; Fagettib, C.; Vitancurtb, J. and Cond, D., 2008. Establishing limits to aquaculture in a protected coastal lagoon: Impact of Farfantepenaeus paulensis pens on water quality, sediment and benthic biota. Aquaculture. Vol. 277, No. 1-2, pp: 3-30. Sanz-Lázaro, C. and Marín, A., 2011. Diversity patterns of benthic macrofauna caused by marine fish farming. Diversity. Vol. 3, pp: 176-199. Varghese, M.; Joseph, S.; Joseph, I.; Ignatius, B.; Manisseri, M.K. ; Thomas, V.J. ; and Sydarao, G., 2010. Preliminary studies on the impact of open sea cage culture of Lates calcarifer (Bloch) on the planktonic and benthic fauna off Cochin, Kerala. Indian J. Fish. Vol. 57, No. 3, pp: 75-77. Walters, G.L., 1989. Hach water analysis handbook. Hach Company, Colorado, USA.